Welcome to Retro Recipes! Brought to you from the capable kitchen of Eat Me Daily's Stephanie Butler, each week revisits a preparation from the past that straddles the line between ingenious and absurd. This week: Clam Chowder Pie. Cake or pie? It's the eternal question. Fortunately, Nancy Fair McIntyre's 1969 cookbook It's A Picnic! (Amazon ) is here to provide us with an answer. Because while clam chowder cake is disgusting and wrong, McIntyre's Clam Chowder Pie recipe is somehow so very, very right. Not a traditional clam chowder, or even a traditional pie, the Clam Chowder Pie seems to straddle a no man's land between pot pie and casserole. The chowder itself is thicker than a normal one: the consistency of a thick stew instead of a soup. And it isn't bound by a normal piecrust, or baked in a pie plate, but is instead topped with a generous sprinkling of Saltine crumbs. After delving deep into chowder history, it's hard to think of a more quintessentially American dish than this one. Too often served from cans as an afterthought by lazy casual dining spots, chowder started off as a soup served by Breton fisherman who'd migrated to New England from Newfoundland. The word chowder comes from the French chaudiere, which was the name of the pot those fisherman used to cook up their stews. They would take the leftovers from the daily catch, cook them in salt pork fat, and thicken the stew with flour or (my personal preference) hardtack crumbs. 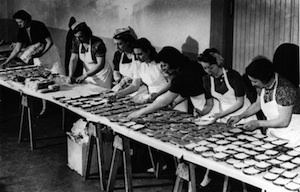 Now, years later, the hardtack crumbs and salt pork fat have all but disappeared, and different styles of chowder dot the United States like oyster crackers on a bowl. Corn chowder originated in the Midwest, while shrimp chowder finds a home on the Gulf Coast. In San Francisco the clam chowder is invariably served in sourdough bread bowls. Manhattan clam chowder is more of a puzzle, as this tomato-based soup was almost certainly not invented in New York City, but probably instead in Rhode Island or Connecticut in the 19th century. The "tomato or no" question is such a divisive one that in 1939 a Maine senator introduced a bill that would have made it illegal to add tomatoes to clam chowder. Let's Have A Picnic comes down on the no-tomato side for their Clam Chowder Pie. All it takes is a couple cans of clams, a jar of clam juice, a few potatoes, onions, and a good amount of heavy cream. The recipe notes that this is not quite traditional chowder: it's thicker and more substantial. All the better to hold together in a pie plate, I suppose. I sliced the potatoes and onions, then got them started in a pot along with my bottle of clam juice. As the potatoes cooked, I made a roux to thicken my sauce by adding one part flour to one part melted butter, then poured a cup of cream gradually, stirring as I went to take out the lumps. Potatoes drained, I reserved the cooking liquid and poured that into the cream sauce, then chucked in my clams and potatoes. Salt and pepper followed, and then I poured the thick chowder into a pie plate. Crushed Saltines went over the top, I popped it into the oven, and waited for my pie to bubble. When you make a recipe called Clam Chowder Pie in 2009, you don't hope for subtlety of taste or nuanced flavors. I was hoping for the homemade equivalent of a can of Campbell's. But once again a Retro Recipe pleasantly surprised me. Clam Chowder Pie is a great quick chowder recipe, even better if you happen to have heavy cream, potatoes, and the rest on hand (it'd be twice as good with fresh clams). Cooking the potatoes in clam juice was a great idea, because it makes the end product richer and clammier than normal chowder. The Saltines? Not so much. They did add a crunch, but why bother crushing perfectly good Saltines to put on top of soup when oyster crackers are made for that express purpose? I say this: for a truly superlative Chowder Pie, get your hands on some puff pastry or Phyllo dough. 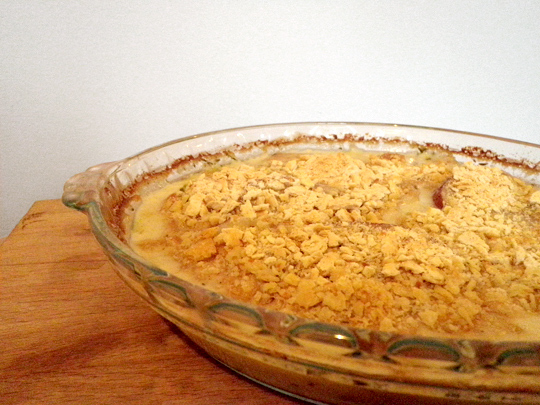 Use that to top your Clam Chowder Pie, thus combining two glorious American dishes into Clam Chowder Pot Pie. Your dinner guests will be happy as…well, you know. Peel the potatoes and cut them into 1/4 inch slices. Simmer the potatoes and onions in the clam juice until tender, drain and reserve liquid. In a large saucepan, melt butter and stir in the flour. Cook for 1 minute, then gradually stir in the cream to make a thick cream sauce. Add 1 cup of reserved broth. Stir the sauce and add the clams, potatoes, and onions. Season to taste. Simmer 2 or 3 minutes. Transfer to a buttered casserole and sprinkle the top with crumbs. Bake in a 350 oven until crumbs are lightly browned. Mmmm, this does sound good. 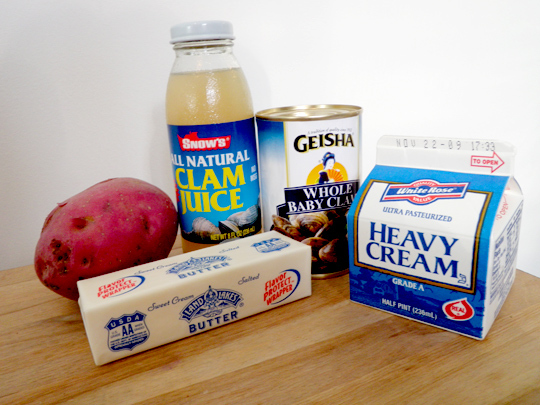 Cream, butter, potatoes, and onions - it would very difficult to go wrong with those ingredients. And yes, just the thought of Clam Chowder Cake is revolting. It wants some celery and a bit of thyme.